Service you deserve from realtors you can trust. 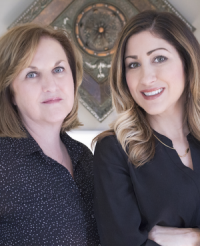 A mother/daughter real estate team we can assist with all your real estate needs in St. Louis and St. Charles Counties START YOUR SEARCH NOW WITH ME… Our company, Select Properties, when formed in 2002, was created to keep our local market. . . well. . . local. St. Louis is our hometown. We grew up here. We live here. We work here. Who knows, you and I may even be neighbors. The thing is, I know St. Louis and all the surrounding counties. I know its neighborhoods – we go to the Hill for Italian, hit the Loop for people watching and know Dogtown is the place to be on St. Patty’s day. We were here when the Arena went down and can remember when Wildwood was actually country. We know its quirks. Our favorite summer treat is handed to us upside down too. We can correctly (ahem or should I say incorrectly) say Gravois, Chouteau and Spoede. But most of all, I know its market . . . because I live in the market, specifically St. Charles County. Our decisions are made based on the same trends that your family experiences right down the street. MY AREA OF EXPERTISE…& RANKINGS Select Properties, formed in 2002, now has 10 offices in the St. Louis Metropolitan area, which includes 2 offices in St. Charles County, 1 office in Lincoln and 1 office in Jefferson County… representing over 550 agents. My Office ranks #1 in the entire company. We're ranked #26 in the Berkshire Hathaway HomeServices national network, ranked #2 in the St. Louis Business Journal Book of Lists of Top Real Estate firms, #2 in real estate transactions recorded by the St. Louis Association of Realtors and in the top 20% of real estate firms nationwide. We rank as the #1 locally-owned real estate firm in St. Louis. Maryann Vitale, Deb Colburn and Angie Ignatowski share ownership of the company, ranking #18 in Women Owned Companies by the St. Louis Business Journal. Our Mission, Our Vision, Our Values… To provide the highest quality real estate brokerage service to my clients and customers and to be recognized in the community for high standards and ethics. My guiding principle is simply doing the right thing every day to earn the trust and respect of each other, my clients and customers. At Select Properties we put honesty, morality, and ethics first. We value providing service to our customers, clients, and each other in the real estate community that out-performs expectations. We also provide a positive environment that is based on faith and principle which rewards commitment to excellence and contributes to the personal growth of the individual and encourages life balance.